Under the moniker 'KittyPlays,' Canadian Kristen Valnicek is one of the world's most popular players of the video game Fortnite. Here, she plays at the Electronic Arts office in Playa Vista, Calif.
On a Friday evening in Vancouver, Kristen (KittyPlays) Valnicek is gathering an all-female squad for a round of Fortnite on Twitch, a video streaming platform favoured by gamers. “I love you, I love you, I love you,” Ms. Valnicek gushes to her followers logging in like party guests, announcing themselves with greetings and compliments that scroll up the right side of the screen. Ms. Valnicek fills the pregame time giving individual shout-outs to the gathering crowd, seeking advice on a snagged thread in her pink turtleneck and flicking away a request to show her bra. “I am not wearing a bra, so, great question, no, you cannot see it.” At the 21-minute mark, a male voice calls from off screen: “Yo, can everything in the washer go in the dryer?” Ms. Valnicek hops up, and disappears, to rescue her laundry. Her followers admire Yuri, the Great Dane who plays co-star from his dog bed, and await her return. Ms. Valnicek guides her black-clad, cat-eared avatar through a game of Fortnite, broadcast on her Twitch stream, where she has more than a million followers. Her larger plan, as it happens, was this: Quit university a few credits shy of a business degree, disappear into her parents’ basement in Kelowna, B.C., to play video games 24-7, and make a very comfortable living as one the most popular female players of the most famous first-person shooter game in the world. Ms. Valnicek has one million followers on Twitch alone – 1,700 will view her Friday stream. Those are success-story statistics, especially for a female gamer. But she is still just one of more than two million streamers creating live content on Twitch. The site’s 15 million daily users, according to the TwitchTracker website, watched 947 million hours in March alone. In that gaming world, A-list male players are still, by far, the headline acts. But Ms. Valnicek, 27, represents a rising group of talented, charismatic and business-savvy female gamers gaining ground, in part, with help from a blockbuster benefactor: Fortnite. On Twitch, Ms. Valnicek is the third most followed female streamer; the first is another Canadian, Pokimane. Last year, Ms. Valnicek was named head of new gaming initiatives at Gen.G, an e-sports company that has been recruiting a cadre of professional female Fortnite players. In February, she was a commentator for a major Fortnite tournament in Los Angeles. She’s now moving to California, in part, to prep a new, monthly interview show called “Playtime with KittyPlays," which will stream live in front of an audience in a Las Vegas e-sports arena. Her first guest will be Baker Mayfield, quarterback for the Cleveland Browns. Given her trajectory, Ms. Valnicek is enthusiastic about opportunities for women in the highly lucrative gaming industry. But talk to female gamers, academics and women already working in the field, and while many speak admiringly of Ms. Valnicek’s ascent, their muted optimism comes with caveats. A handful of big names aside, much of the success women have achieved has happened outside the mainstream gaming culture, in the growing indie community where series such as Nancy Drew, an adventure-mystery game, have thrived by creating complex, interactive narratives. Stories abound of workplace harassment at gaming companies. There’s no shortage of female players – women, according to industry statistics, make up close to half of global gamers. But they are much more heavily concentrated in mobile platforms and so-called “casual games,” such as Candy Crush. The competitive AAA titles that dominate Twitch and e-sports are typically first-person shooter brands, set apart as the domain of “serious" (i.e. traditionally male) gamers. They have fewer than 10 per cent female players, according to Quantic Foundry, a game analytics company. More than other games of its kind, Fortnite feels like a fun place where you go to hang out with friends. Although Epic Games, the company that created Fortnite, is cagey with statistics, SimilarWeb, a marketing firm, reported last summer that, globally, women made up at least 16 per cent of the game’s then-125 million active players. Closer to home, by comparison, women add up to a higher ratio of the game’s enthusiasts: Verto Analytics reported last year that among U.S. Fortnite players over the age of 18, women accounted for 27 per cent. It happened again, in January, when a female player named Ellie was chosen for a competitive Overwatch team, another popular e-sport game. New players are scouted by team managers based on their performance within the game and recommendations from other gamers, but not always met in person; in this case, the team Second Wind needed a substitute on short notice, and said later that they had underestimated the significance of being the first team to choose a female player for Contenders, a major global tournament one level below professional players. Fans were skeptical – she’d appeared out of nowhere – and the tone turned nasty. It soon came out that Ellie was really a top male player named Punisher, conducting what he called a “social experiment.” The chief result of that experiment, as many women (and men) in the industry noted, was to cast more doubt on the next real-life female player to break through to a prestigious team. Raven Firman, 21, plays the first-person shooting game Overwatch at St. Clair College in Windsor, Ont. Despite being competitions where men have no physical advantage, video games still sideline or diminish successful female players, says Angela Natividad, the co-founder of Hurrah, an e-sports advertising firm based in France. Last year, Ms. Hostyn, became the first woman to win a major international StarCraft II tournament. A few months later, at a panel discussion involving prominent gaming executives, Ms. Natividad listened to a debate about whether there was enough “scientific research” to prove women could play as well as men. Natasha Watt, 25, is one of the first women enrolled in St. Clair College's Esports management diploma program. Certainly, that’s been Ms. Valnicek’s approach. In 2014, she spent the Christmas break of her fourth year of university playing Counter-Strike, a first-person-shooter game with a terrorist storyline, for nearly 12 hours a day, the sound of her yelling into a microphone travelling up the basement stairs of her family’s home. By the end of those two weeks, she’d already made thousands in “tips” from followers, and she was done with school. “It was every parent’s nightmare. But I knew she wasn’t happy,” says her now-proud father, Stan Valnicek, a plastic surgeon and avid gamer who bought his game-obsessed daughter an Xbox when she was 10, and was soon getting destroyed in Halo and Counter-Strike. “For two years,” Ms. Valnicek says, “I ate, slept and streamed.” Her success was helped along by good looks and good timing. Twitch was just taking off. But building – and keeping – an audience requires full days of on-camera gaming, sometimes with hardly anyone watching. Eventually, the trolls find you. At the dinner table, on her breaks, Dr. Valnicek says they’d brainstorm strategies to handle the sexual harassment and lewd comments, a near constant element for most female gamers. As in every context, having to handle/deflect/ignore harassment takes up brain space that might be spent on game play, for fun or for money. “It makes it hard to do your job,” says Celia Pearce, a game designer and professor at Northeastern University in Boston, “even if your job is playing video games.” Female players describe staying quiet to mask their identity from male players – a strategy employed by Linda Zhao, a Grade 10 student in Richmond, B.C., the president of her high school e-sports team, and an avid player of League of Legends. Even so, it slips out sometimes; in that case, she tries to deflect comments by telling the harasser that she’s underage. “One guy told me I’d be worth the jail time,” she says. 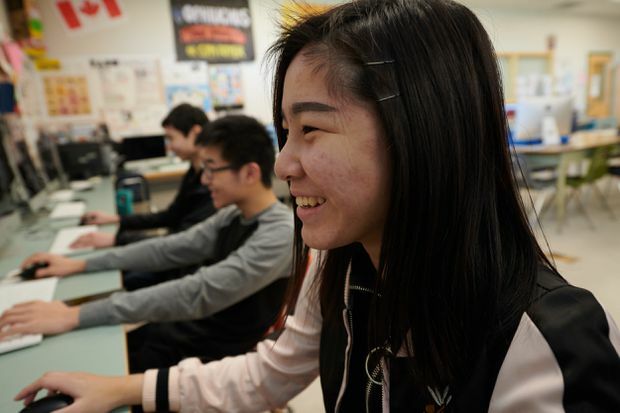 Linda Zhao, 15, is a Grade 10 student in Richmond, B.C., who games League of Legends 10 to 15 hours a week. In December, she led her team in a high-school tournament where they won first place. The harassment, for instance, is the reason Karen Skardzius, a York University graduate student studying female streamers for her PhD, finally quit Overwatch last year. “It just took the joy out of it,” she says. She forwards a screen shot of a message she received from a male player telling her to “stick to the kitchen, honey," compounded by a crude sexual demand. Some of the early findings of her research are that female streamers are more likely than men to specify codes of conduct for their viewers (although enforcing it is another matter), and even enlist members of their community to shut down harassers so they don’t have to. Still, she was on a year-long break from the strain of constant streaming when Fortnite came along. The game’s colourful graphics but still competitive play matched the upbeat mood she wanted to create with her Twitch channel. In Fortnite, the conversation was friendlier, she says, although her growing fame and influence no doubt help. She also started a group of female players on Discord, a chat site for gamers. The members include mothers who sometimes have to hide their avatars mid-game to check on a crying baby, and iCarly, a talented player Ms. Valnicek recently recruited to the Gen.G team to train full-time for the coming Fortnite World Cup, with its $130-million pot of prize money for the 2019 season. Ms. Valnicek won’t compete herself – she’s approaching the age when many competitive players retire for a normal life, or owing to burnout or injury. (To become a professional player requires long hours in front of a screen – and, big names aside, the majority don’t make a lot of money doing it.) She plans to keep streaming on Twitch, but not as intensively as in the past. “I want to be in the background foreground now,” she says. Both the talent, and the boss. Still, when Fortnite comes back up, the conversation focuses on winning, alerting teammates to hidden opponents, requesting cover when needed. Closing in on six hours, in the last match of the night, Ms. Valnicek is caught in a gunfight when a teammate eliminates the final player, winning them a Victory Royale. “Good job, girls, well played,” she cheers. The other players leave the stream while she banters with her followers for a few more minutes. Then she blows the screen a kiss, and signs off, until tomorrow.